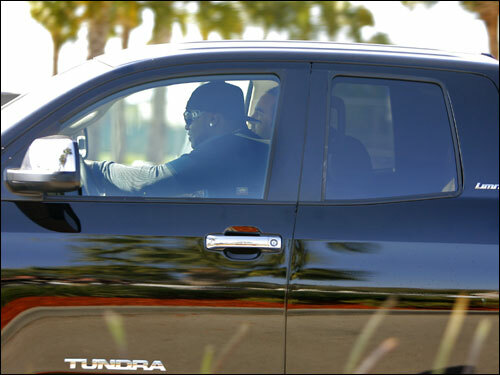 Red Sox superstar David Ortiz rolled into camp this morning and sped out this afternoon in the new Toyota Tundra truck that he said team owner John Henry awarded him this morning. Ortiz revealed the gift when he was asked a question today about all the perks that were afforded this offseason in the acquisition of Daisuke Matsuzaka. Ortiz joked that maybe the truck was an act on ownership’s part after baseball salaries exploded during the offseason. The slugger will make $11.5 million this season, a relative bargain on the market for a player that hit 54 homers and 137 runs batted in last season. The 31-year-old Ortiz’s deal runs through the 2010 season (there’s also an option for 2011). The one gift Ortiz didn’t receive Wednesday was the batter who hits behind him in the lineup. Red Sox general manager Theo Epstein confirmed today that Ramirez will report March 1 because of a family issue. When asked if he was pleased that Ramirez was not traded in the offseason, Ortiz said the market simply was not there for any deal to be made. “It’s hard to find a player like Manny,” he said. “When you go out there, Manny’s got to be one of the best hitters in the game, no doubt about it. It’s hard to trade Manny because of his salary. It’s hard to get somebody when you trade Manny. That’s what’s been the problem…get what you deserve. Ortiz said the offseason was difficult in his Dominican homeland because he has become so recognizable (Despite Julio Lugo’s assertion that he could run for president and win, Ortiz said he had no interest in being a politician because everybody hates you once you become one).